Celebrating our Abundance, Embracing our Kuleana, Breathing Ea into Our Future. On July 31, 1843, the ea of Ko Hawaiʻi Pae ʻĀina re-emerged through an act of pono. 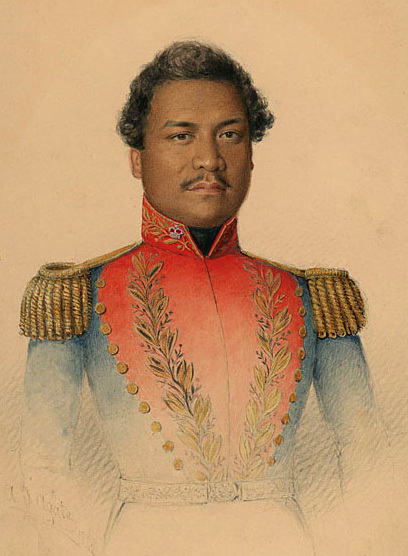 “Ua mau ke ea o ka ʻāina i ka pono.” The reigning Mōʻī at the time, Kauikeaouli (Kamehameha III), said it best. “The ea (sovereignty, independence, life) of the ʻāina continues on, because it is pono.” For a little over five months leading up to that joyous day in July of 1843, the British flag flew above our beloved Hae Hawaiʻi (Hawaiian flag). On February 25 of that same year, Kauikeaouli had temporary ceded his sovereign authority as Mōʻī (reigning monarch) of the Hawaiian Kingdom to Great Britain after Lord George Paulet, commander of the British frigate Carysfort, had landed his warship in Honolulu and threatened the Mōʻī with violence. Paulet, acting on his own accord, had demanded an audience with Kauikeaouli just days earlier, while responding to a request from the British Consul to the Hawaiian Kingdom, Richard Charlton, to investigate claims of a property dispute between Charlton and the Hawaiian Kingdom government. After Kauikeaouli had refused to comply with his demands, Paulet threatened to attack the town of Honolulu with military force, compelling Kauikeaouli to temporarily surrender, under duress, his sovereign authority to Great Britain. As history tells us, Paulet proceeded to lower and destroy all the Hawaiian flags in his reach, raising the British flag in their place. This wrongful act marked the beginning of a five-month occupation of Hawaiʻi by the British. Kauikeaouli (Kamehameha III) "Ua mau ke ea o ka aina i ka pono." July 31, 1843. 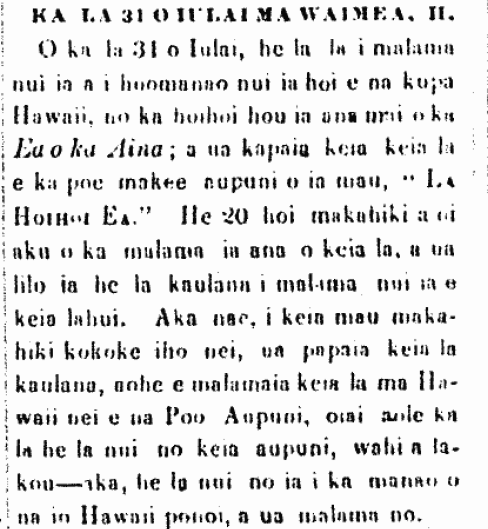 An article from the Pacific Commercial Advertiser, Aug. 5, 1865, describing the Lā Hoʻihoʻi Ea celebration in Honolulu at which Lunalilo gave his speech. It should come as no surprise, however, that many of us today grew up never hearing of this great day of celebration. Like other national holidays of the Hawaiian Kingdom, Lā Hoʻihoʻi Ea was not acknowledged by the governments that have occupied our homelands since the overthrow of our beloved Queen in 1893. It was not until last year that the County of Hawaiʻi first officially recognized Lā Hoʻihoʻi Ea as a holiday, thanks to the efforts of a number of Hawaiʻi’s poʻe aloha ʻāina. Regardless, however, of whether or not the government recognizes this significant day in our history, it is nonetheless a kuleana of ours to honor Lā Hoʻihoʻi Ea and celebrate all that it represents for the future of our lāhui Hawaiʻi, just as our kūpuna did. ​In his stirring speech about the meanings of ea at a Lā Hoʻihoʻi Ea gathering in Mānoa, Oʻahu, in 1871, Davida K. Kahalemaile called upon all of us, the people of this ʻāina, to remember this day for the many generations to come. “Auhea oukou,” Kahalemaile called out, “e na makua mea keiki i loaa ka pulapula, i puka i ke ao, ulu i ke ao, kawowo i ke ao...a hiki i ka hopena o kou kanikoo ana, hai aku oe i kau pulapula, ke noho la i ke ao malamalama, e hoomanao oe i ka la i hoihoiia mai ai ke ‘Ea o ke Aupuni,’ ke ola o ko Hawaii Pae Aina, ina no aole malama na Poo Aupuni, malama no kakou, o ko kakou malama ana, o ko ke alii malama ana no ia. Nolaila, e olioli kakou, a e hauoli pu me ka manao lokahi. E ola Ka Moi i ke Akua!!! Ua mau ke Ea o ka Aina i ka Pono!!! !” (Ka Nupepa Kuokoa, Aug. 12, 1871). (To all of you who are parents with children—those of you who have offspring that have emerged into this world, grown in the light, and multiplied in the light...Until the end of your days of walking with a cane, tell your offspring, ‘for as long as you live in the light of day, you should remember the day on which was returned the ‘Ea of the Nation,’ the life of all who live in these Hawaiian Islands.’ And if the Heads of the Government do not observe this day, we shall care for it. For our care and respect is indeed equal to that of the aliʻi. Therefore, let us celebrate and rejoice in unified thought. Life unto the Mōʻī from the Akua!!! Ua mau ke Ea o ka ʻĀina i ka Pono!!!!). It is in this re-membering of our past that we breath Ea into our future. "The 31st of July in Waimea, Hawaiʻi." 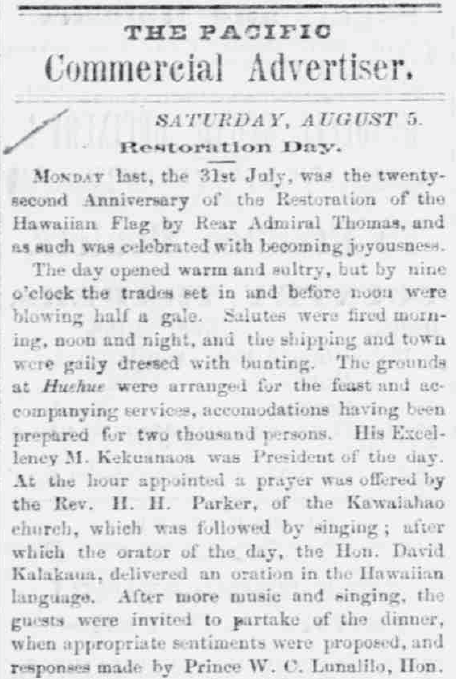 An article describing Lā Hoʻihoʻi Ea celebrations in Waimea, Hawaiʻi Island, in 1871. Click on the image to see the full article. 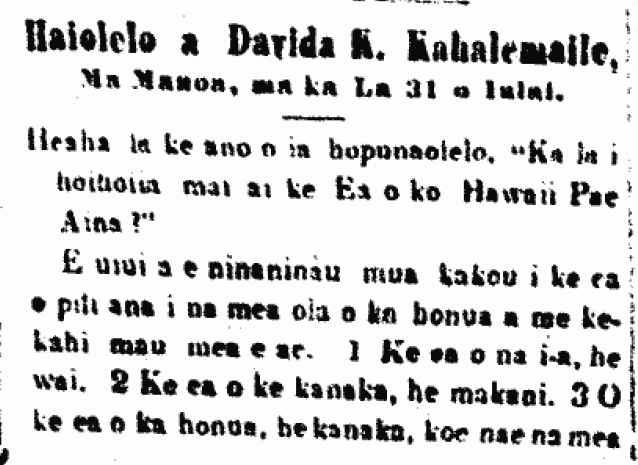 The speech of Davida K. Kahalemaile at Mānoa, Oʻahu on Lā Hoʻihoʻi Ea, 1871. Click on image to see the full speech. Inspired by aloha ʻāina across the archipelago who have revitalized the celebration of Lā Hoʻihoʻi Ea, Hui Mālama i ke Ala ʻŪlili (huiMAU) will be sponsoring a community celebration of the 175th anniversary of Lā Hoʻihoʻi Ea, on Saturday, July 28 of this year, in Hāmākua at the Paʻauilo School Field. Our hope for this event in Paʻauilo is to bring our Hāmākua community together to celebrate our own ea—the abundance of knowledge, skills, values, and life-giving practices in our community, past and present, that hold the potential for our return to a thriving Hāmākua and Hawaiʻi island community in the future. Our intention is not only to celebrate this important national holiday and its link to our history of a sustainable, independent past, but more importantly, we want this to become a day for us to gather annually as a community to share, learn, and envision the ways in which we can create sustainable, interdependent, thriving futures for our ʻāina and people here in Hāmākua. We welcome all in our community to come share in this family-friendly, drug and alcohol-free event, featuring local food vendors, farmers, Hawaiian craft vendors, games for the whole ʻohana, educational activity booths for all ages, speakers, and live music by Kainani Kahaunaele, Ho-a, and Jon & Jamaica Osorio. For more information, follow Hui Mālama i ke Ala ʻŪlili on Facebook & Instagram!